Prepare for a gluten free feast! 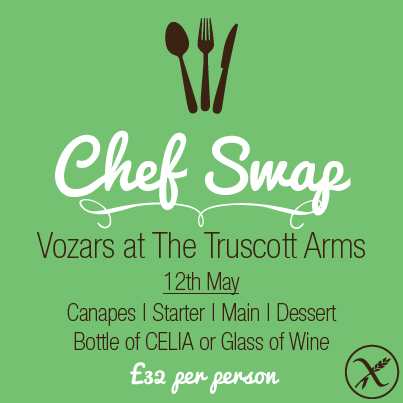 Martin Vozar of 100% gluten free restaurant Vozars is going to be cooking up a storm at our favourite gluten free friendly pub The Truscott Arms. Gluugle is coming alive before our eyes! It’s great to see so many people getting involved by adding and sharing their favourite gluten free places. To reward all of your hard work, the person with the most number of “places reviewed” on the 10th of October will win a case of Celia gluten free lager and a meal for two at The Truscott Arms in London! This excludes GluugleHQ of course, because that would be no fair. It also excludes The Gluten Free Foodie, but if you care to beat her anyway you are most welcome, though she won’t be happy! Get Gluugling my friends, and good luck! Well it’s been a long time in the pipeline, but Gluugle is finally here! We have been very busy beavering away and trying to find the best bloggers from across the country to add their favourite gluten free places. These founder members and their recommendations mean that Gluugle has content from the very beginning. But we want your input! So what are your favourite gluten free places? Get adding! There will be competitions coming up for the top reviewers – so keep your eyes peeled. Don’t forget to follow @GluugleHQ on twitter for all the latest news.